Cook Islands U-16 captain Tumatangi Tumatangi. Leading the Cook Islands U-16 team onto the pitch at the Loto-Tonga Soka Centre in Tonga during the OFC U-16 Championship Qualifier has been an honour for Tumatangi Tumatangi. The young defender is relishing taking on a leadership role in his second regional competition this year, after lining up as one of the young ‘uns during last month’s OFC U-19 Championship. He’s also enjoying a slightly slower pace, though admits it’s still tough going against some strong sides. “The level here is alright, maybe a bit tough. But the U-19 was harder, the ball speed was fast and the U-16 is nothing compared to that,” Tumatangi said. “I guess I can say that being one of the younger ones in the squad meant the U-19 was a bit harder, but I can’t really help that,” he joked. While he can rely on his sense of humour to get him through some of the tougher aspects of taking part in a competition of this level, Tumatangi also has to maintain a level of professionalism as captain of his team. “It’s an honour, it’s a great privilege to lead my team and I think I was chosen for my good sportsmanship and always leading them on the right path,” he explained. Even harder when you then have to try and boost morale after an opening loss, with two matches still to play. Tumatangi didn’t take a direct path into football and actually began playing rugby. “When I was young one of my coaches always wanted me to play soccer but I didn’t really want to because I was big-headed and wanted to play rugby,” he said. “But when I grew up I started to think about my coach and what he said to me and decided I wanted to achieve that goal of becoming a footballer. 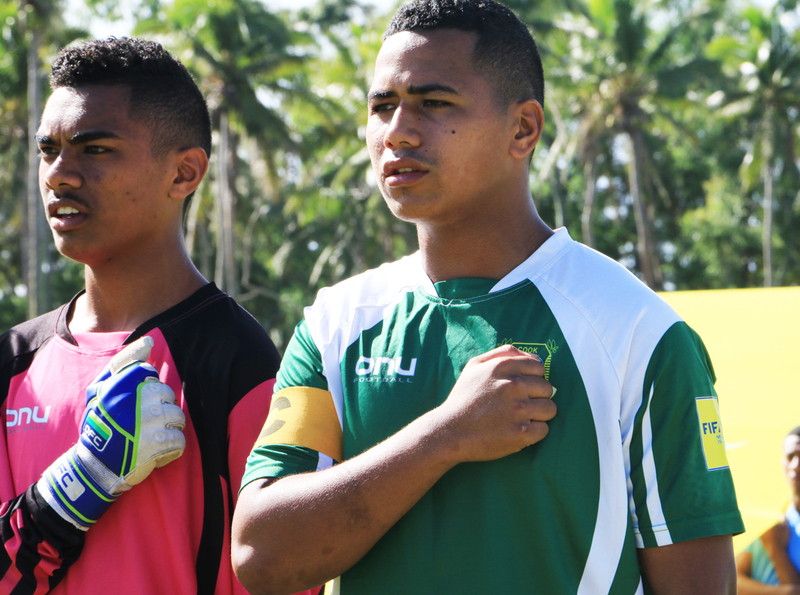 Tumatangi and the Cook Islands will try to get their campaign back on track with a win over hosts Tonga when they meet at 2pm tomorrow at the OFC U-16 Championship Qualifier.